How to Identify Fake/Phishing links without clicking on it ? As we all know that the no. of hacking and scam day by day is increasing ,and we have to be very carefull for our personal identity and email detail on internet and as now so many link and website provides a direct sign-up through facebook,twitter and other social media and as hackers also use this trick and this is called as phishing links so,,how to check that a particular link is fake or real. 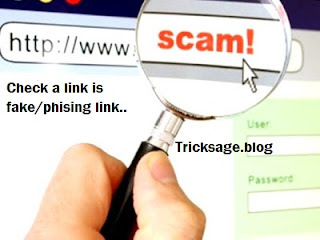 And to check this tricksage brings a awesome trick without clicking on that link on site ,,,so simply see below part to check..
Just to check the link/website is fake/phising link or real.without clicking on that links. Now go to this link by click here and paste the link you copied from address bar and the rest of work will be done by the given link. CLick here to Go to the link and paste the link to be checked..